TICKETS STILL AVAILABLE AN HOUR BEFORE ROUTE START TIME! Route 1 // 9:00am - Noon // 2 mile route. 5 stops. Route is designed to bike or jog. Walking or driving is available, too. ​Route 2 // 9:30am - 12:30pm // 8 mile route. 5 stops. Route is a self-driving route. Route 3 // 10:00am - 2:30pm // 28 mile route. 7 stops. Route is a self-driving route. 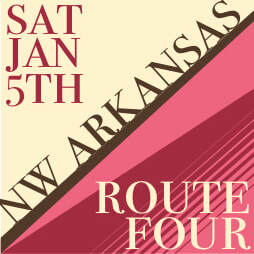 Route 4 // Noon - 4:00pm // 23 mile route. 6 stops. Route is a self-driving route. This route 1 visits 5 different stops starting at 9:00am, sharp, at Onyx Coffee Lab (100 NW 2nd St Suite 106, Bentonville, AR 72712). Other stops include Cafe 211, Heroes Coffee Company, Airship Coffee, and this route ends at Markham & Fitz Chocolate Makers at noon. Distance of the 5 stops is 2 miles, and is designed for biking and jogging. Also, available to drive or walk. This is the only route designed to visit stop-to-stop without a car. Only 4 tickets left!This route 3 visits 7 different stops starting at 10:00am, sharp, at Arsaga's Coffee Roasters (200 W Center St a, Fayetteville, AR 72701). Other stops include Savoy Tea, ​Mama Carmen's Espresso Cafe, Puritan Coffee & Beer, Bolder Coffee, and this route ends at Onyx Coffee Lab - new roastery in Rogerswith a dual stop with special guest Rishi Tea at 2:30pm. Distance of the 7 stops is 28 miles, and is designed for self-driving. This route visits the most locations. This route 2 visits 5 different stops starting at 9:30am, sharp, at Heroes Coffee Company (124 SW 8th St, Bentonville, AR 72712). Other stops include Airship Coffee, Kennedy Coffee, and this route ends at Onyx Coffee Lab - new roastery in Rogers with a dual stop with special guest Rishi Tea at 12:30pm. Distance of the 4 stops is 7 miles, and is designed for self-driving. This route has the least amount of physical stops to make, but still participates with 5 different businesses. This route 4 visits 6 different stops starting at noon, sharp, at Onyx Coffee Lab (100 NW 2nd St Suite 106, Bentonville, AR 72712). Other stops include Cafe 211, Markham & Fitz Chocolate Makers, Kennedy Coffee, Bolder Coffee, and this route ends at Puritan Coffee & Beer at 4:00pm. Distance of the 6 stops is 23 miles, and is designed for self-driving. This route is our latest route, and will have a focus including beer (optional) at the end.